My precious little Titus sang this song almost every day when he was little. He pattered all over the house singing it right after he learned to talk. He got it from me because I sang it to all my little cozy baby bundles. ...those are the ones whose hearts I hold in my hands. The Sunshine is out there, you just have to look. In fact, it's probably shining on your face right now. I love that song! That is so sweet that you sing to your boys. I'm sorry you went through tough times. I wish I could've been there for you. I hope you know I value you as a friend and am here if you ever need anything in the future! so beautiful... and so important to appreciate those around us. I appreciate you too- hope I can be 1/2 the mom you are! How sweet! I sing that to Preston all the time!!! I love it! What a great post with an encouraging and inspirational message. So true- the sunshine is always out there! oH THE MEMORIES YOU BROUGHT BACK! My Dad used to sing this song to us when he would get us up (not often maybe once a week or so). He would flip the blinds so they would clatter up the window as he was singing that song! Sure wish I could hear him sing that one more time- lost him 5 years ago but he gave alot of good memories to keep him near! sweet post...heartfelt thoughts. i KNOW where my "sunshine" is :) THANK YOU for the reminder. What a sweet post! I think that's adorable about your little boy singing that song! What a wonderful post. It sure does make one stop and think about all the blessing around us. Thanks for being a sunshine beam today. I am feeling the exact same way as your post says! What a amazing post! You are truly a inspiration! That was such a sweet post. My little boy is just starting to sing now. It is the sweetest sound ever. BTW, did I tell you that you are my new favorite follower because of your last comment!! :) Thank you so much. Hi Lisa.....thanks for visiting my blog this week. :) Your blog post is so sweet....thank you! This is a great post for a melancholy day. 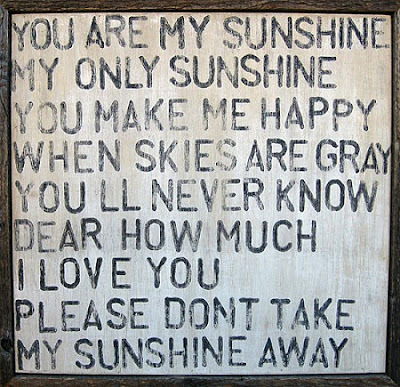 Also, my kids love "You are my sunshine." It's the song that always comforts them and gives them what they need (whether that's a shot of happiness or a reminder that they're loved). What a sweet post! I love that sign! Thank you for sharing. It really is a lovely little song that seems so many of us have a soft spot for. You are so right sunshine is free and so often right in front of us to enjoy if we choose to appreciate it. What an absolutely lovely post. I think I will take time out to thank my life changers tomorrow! What a beautiful post. What would we do without our family? beautiful post! it makes me very happy to read such sweet words. and I love that the photo worked so well with your message!